These new sensibly sized power connectors with T- and S-coding open up the power range, satisfying the requirement for compact and economical power connectors resulting from the miniaturising of drives, encoders and decentralised equipment cabling. The connectors with S-coding have been designed for 630 V and 12 A, the connectors with T-coding for low voltage supply of 63 V and 12 A. The new M12, 3+PE and 4-poles x 12Amp connector codings comply with IEC 61076-2-111. M-style connectors are categorised by the size of the threaded locking nut; these include M8, and M12 connectors. Tough and robust, these waterproof, circular screw connectors are the de-facto standard in the process industry for reliable automated connections: protected to IP67 and Food + Beverage Industry types to IP69K. The M8/M12 standard is also ideal for applications where a compact, reliable connection system with IP67 environmental protection or extra heat resistance is required. 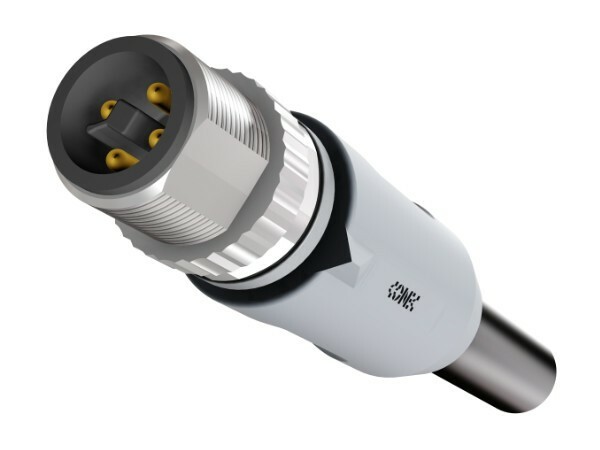 The largish M23x1 connector has been much used to date for power but as devices used in electrical drive technology become more and more compact, Conec have now made it is possible to transmit signals, data and power non-stop using the M12 connector system. The new M12, 3+PE and 4-poles x 12Amp connector codings comply with IEC 61076-2-111. Due to the actual geometry, plugging and pulling under load is neither electrically safe or admissible. Only socket and plug devices are designed to be actuated under load. Therefore these connectors/cables should only be energised once in the mated condition! Currently Axially overmoulded products are available with different cable qualities, and sockets with stranded wires for front or back panel mounting. These new power connectors with T- and S-coding open up the power range, satisfying the requirement for compact and economical power connectors resulting from the miniaturising of drives, encoders and decentralised equipment cabling. The connectors with S-coding have been designed for 630 V and 12 A, the connectors with T-coding for low voltage supply of 63 V and 12 A. Number of poles: 2-, 2+PE, 3-, 3+PE, 4-pol. M8 and M12 connectors are used in an incredible array of industrial applications like robots, sensors, vision systems, RFID and PLCs, actuators, electric motors, console lights, switches, valves, and contactors, the automotive industry plus machinery and tooling, packaging, factory automation, and food and beverage production areas. These power connectors with T- and S-coding open up the power range, satisfying the requirement for compact and economical power connectors resulting from the miniaturising of drives, encoders and decentralised equipment cabling. The connectors with S-coding have been designed for 630 V and 12 A, the connectors with T-coding for low voltage supply of 63 V and 12 A.